Baseball players of Women, Professionals, Senior Amateurs, Colleges, 18U, 15U, and 12U gathered in Tokyo on November 6, 2013 to launch a new uniform for the Japanese national teams of all categories. To pay respect to bravery of forefathers, the letters “JAPAN” use the same writing as those of the first national team’s’ jersey of 82 years ago, in 1931, when they played the first international game against Major League All Stars and lost 0 – 17. 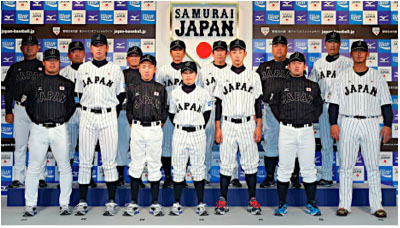 The new uniform to be worn by the national team of all categories symbolizes unity of Japanese baseball community: professionals, amateurs and women alike, and aim for the ultimate goal, Samurai Japan.